This is really cool, I could interact with this for ages. The lights somehow connect to the people on the ground then joins them all up to make patterns which change shape as the people move round. You really do become part of the work. It continues to 14th October so I’m sure I’ll be back a few times. 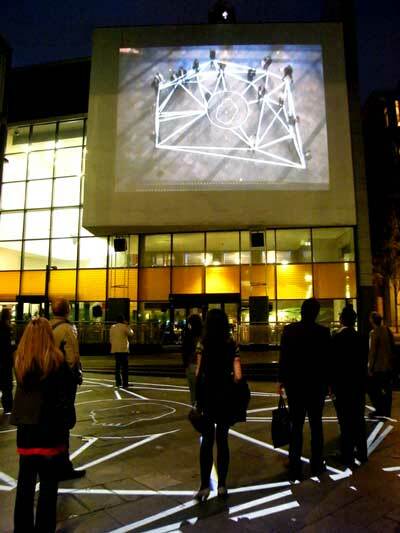 It is also part of AND Festival and is in Arthouse Square at the back of FACT. Evenings, after dark only. Strange Attractors – The Anatomy of Dr Tulp is a study of embodied discourse; how we use our bodies to move and to communicate in a material world, and how our bodies mediate between the internal and external worlds, at a microscopic and global level. Modern biology has shown that matter is far from inert; it is ‘self-organising’. Theories such as Epigenetics, the idea is that environmental factors can cause an organism’s genes to behave (or “express themselves”) differently, even though the genes themselves don’t change, point to the complex self-organising qualities of matter. Strange Attractors is a playful study of these complex relationships; Using light projected onto the ground, it examines the relationship between the motion of real, inanimate, and virtual bodies. When people enter the space they become active participants, as magnetic bodies themselves, bringing life and animation, disturbing and redistributing the ﬂow of energy through the system.